This is the time of year when grass plants recover from disease, heat, drought, and other summer stresses and starts to prepare for the dormant period ahead. By fertilizing in the late fall, individual grass blades can store carbohydrates in their stems, stolons, and rhizomes. A reserve of carbohydrates enables your lawn to resist injury and disease over the winter. It also acts as an energy source for roots and shoots when spring arrives several months from now. Finally, fertilization in the late fall provides better coloring over the winter and enhanced green color next spring. Timing is everything when it comes to late fall fertilization. You should wait until the grass has stopped growing and rarely needs mowing. It’s okay if your grass still has some active growth, but it should be slow enough that you don’t need to mow it. However, you don’t want to wait so long that the ground freezes. Be sure to pay attention to the weather forecast and get the fertilizer down ahead of the freeze. Although it can be tricky to get just right, proper timing is essential for late fall lawn fertilization. If you apply fertilizer too early, it could encourage winter injury and mold growth due to snow. Putting fertilizer on top of snow or ice won’t have any benefit at all. Your lawn needs nitrogen more than any other ingredient this time of year. We recommend applying one pound of soluble nitrogen for every 1,000 square feet or up to two pounds of slow-release nitrogen for the same amount of grass. You should purchase a complete fertilizer with a high percentage of potassium and nitrogen to ensure resistance to cold, disease, and wear as well as enhanced rooting. However, it should not contain too much phosphorus since the run-off from this ingredient can damage local rivers and streams. 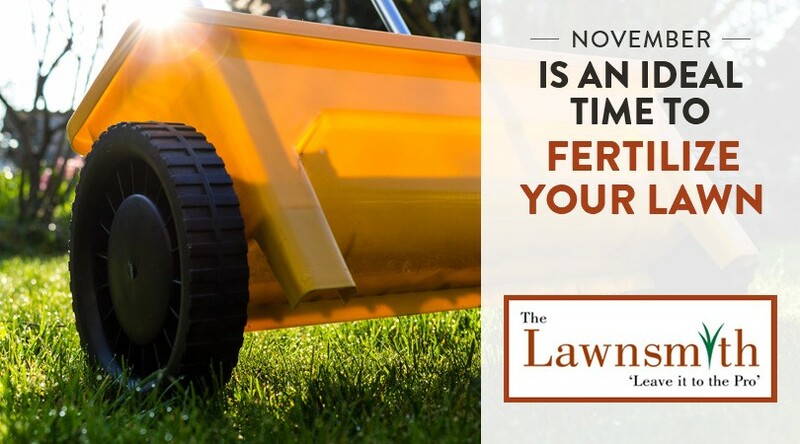 If you’re not certain which type of fertilizer to choose or would prefer that a professional fertilize your lawn, contact The Lawnsmith to request an appointment. We recommend that you do so as soon as possible since the ground could freeze within days.